Last weekend I met up with Jenny & Jessica to stroll through Central Park in hopes of seeing the leaves in yellow/orange/red but they were still mostly green with hints of yellow and orange. It was a beautiful afternoon nonetheless, despite the drizzly overcast weather. I am so grateful to be able to surround myself with people that have the same interests as me and also connect with bloggers I used to follow when I lived in Reno. Also, we rounded the corner of one of the paths and came to the very famous row of trees/benches/lampposts and had a total "ah-ha!" moment because we all recognized this location from photos and movies but didn't know exactly where it was. 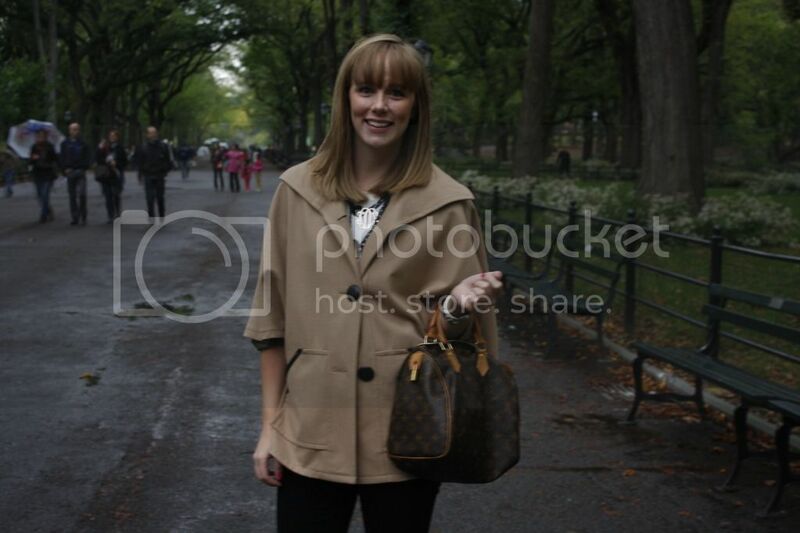 Here's what I wore that afternoon! OMG need that sweater!! ASAP!! Haha, so cute!! I need a cape! I'm always making capes out of non cape things (and in a non super hero manner haha) anyways, and yours is such a nice staple! Love the white over olive too! Super cute as usual! 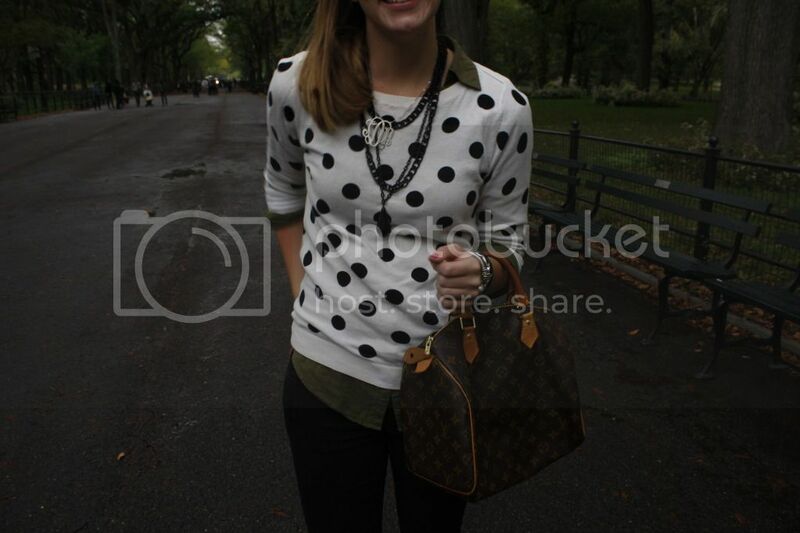 The layers, dots, and cape are perfect for a stroll through Central Park. so fun! central park is the best :) i plan on going into the city saturday and walking thru there [since im literally 10 mins outside of manhattan!] I LOVE that cape!!! such a great color and looks amazing on you. 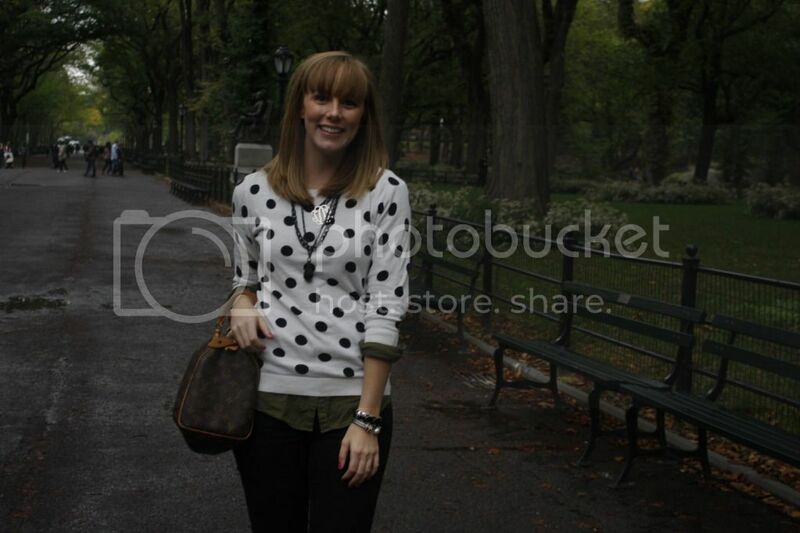 Very cute sweater - I love polka dots rights now! Looks like such a beautifully fall day! Love the outfit.